The first memory I have of my mother is her straddling an open window, pink sari bunched around her waist like a protective cushion, shouting she'd jump. 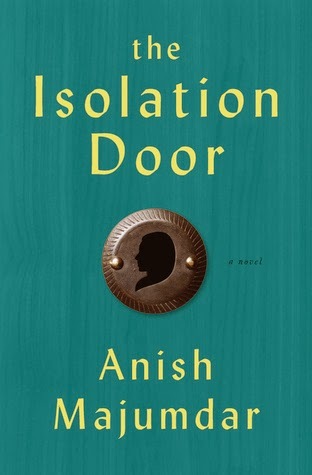 Synopsis of the Isolation Door by Anish Majumdar: Neil Kapoor, 23, finds the fragile threads of a new life threatened by a mother's descent into schizophrenia. The debut novel of acclaimed journalist Anish Majumdar examines the inner world of the mentally ill and those within their gravitational pull. A mother's delusions of Bollywood stardom become a son's raw materials for finding happiness beyond her shadow. Enlisting the aid of an Aunt with means and questionable motives, Neil finds love and forms crucial friendships. But when the life he's kept secret begins to crumble, a choice must be made: family or freedom? Intimate in approach and devastating in impact, The Isolation Door marks the arrival of a unique talent in American letters. A portion of the proceeds from the sale of this book will be donated towards schizophrenia research and treatment. Tomorrow I will be posting my review and holding a giveaway of this book, so please pretty please come back! This talks about mental illness and I thought this was an amazing read. You probably hear me say that quite a lot lately. Shall we just say that the right books have landed in my hands? O interesting. I like the first line. great picture. and pretty scary too, to have that as your first memory of your mother!! Looking forward to your review. I love the beginning and 56, what a crazy ride it must have been with her mother. The beginning definitely grabbed me and made me want to know more, and I loved the description from Page 56. This sounds like an excellent book. Sounds interesting. I like the cover too.